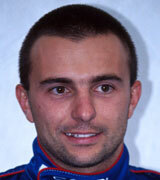 Of those who have managed to qualify and line up on the starting grid, Marco Apicella's Formula One career has to be up there with the shortest. Offered a drive by Eddie Jordan at the end of the 1993 season, his commitments abroad meant he was only likely to be available for one race, at Monza. But in testing he looked sharp, although he only managed to qualify in 22nd. At the first corner there was trouble at the front, and further back JJ Lehto's Sauber hit Rubens Barrichello and Apicella - the debutant suffered suspension damage and his race - and F1 career - was over in a matter of seconds. Jordan offered him another chance in the next race but Apicella's Formula Three drives in Japan were calling. He was a much better driver than many who have enjoyed longer spells in F1 and had earlier tested for Minardi and Modena. In 1994 he won the Japanese F3000 title, and went on to become a test driver as well as competing in at several Le Man 24 Hours.